All I feel like saying is that I felt like a butcher in a butcher shop. I intentionally head-on'd a Bf-110 C-6 right at the end to nerf myself, though the poor lad died as well in the process. If you newer players want proof that the right plane can be a moving disaster in the right hands, here you go. And for those that fly T5 and T4, well... you now know a name to watch out for. On a final note, i will be keeping this plane because how great of a bot-spanker it is. Just thought i would share my best battle performance of the day. 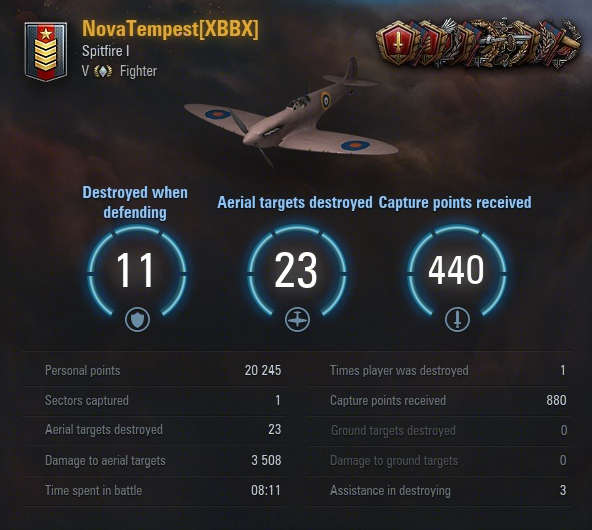 Nice game... but it's worth keeping in mind that the entire Spitfire line is low-skill , high-performance. Thanks guys. I do my best as much as possible of course. "All I feel like saying is that I felt like a butcher in a butcher shop. I intentionally head-on'd a Bf-110 C-6 right at the end to nerf myself, though the poor lad died as well in the process." Great accomplishment in a battle! The only comment I would make would pertain to how you worded the above statement. Without meaning any disrespect you make a "boast" of feeling like a butcher and then you "nerf" yourself, as if an "ACE battle" is somehow not righteous and you need to fall on your sword in penance to spare the other side from any more suffering. Battles in which a pilot gets over 20 kills, above tiers 1-3, should be celebrated and I think the larger majority of players are very understanding when it comes to epic battles and the satisfaction and excitement one has. It sounds to me like you felt some guilt because it was too easy and could not bare running up even more kills on the other team. I think this game has plenty of room for "gamesmanship and respect/courtesy", but you are not obligated to nerf yourself. If you did, well I compliment you on your sensitivity to the possible feelings of your opponents or your own conscious but its alright to obtain all time records and to keep going until the game ends. If your "honorable" that's one thing, if you actually felt guilt, that's another thing. Edited by Prenzlau, 18 April 2018 - 05:12 PM. Not gonna argue with you there, but if I am honest, another part of me felt like the C-6 in question was at low enough health I could survive the head-on.